The toe of this boot has a refined shape with a snug fit. If you have a wide foot or wear thicker socks with your boots, we recommend ordering a half size up. All reviews after October 2018 reflect the Dari Boot's rubber sole. All reviews prior to October 2018 reflect a leather sole. 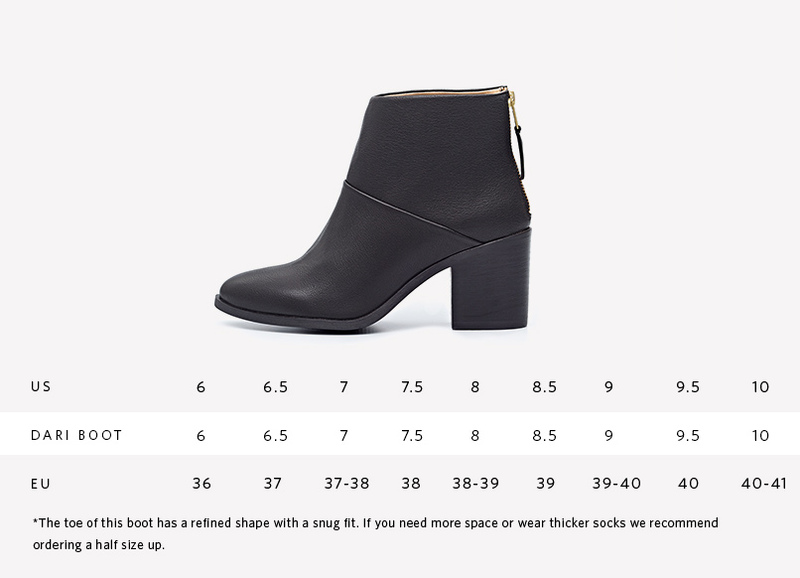 https://nisolo.com/products/womens-heel-boot-black-rubber-sole 1683364708465 Dari Boot Black //cdn.shopify.com/s/files/1/0277/9027/products/Dari.Boot.Black.Rubber.sole.w_large.jpg?v=1539270417 //cdn.shopify.com/s/files/1/0277/9027/products/Dari.Boot.Black.Rubber.sole.w_medium.jpg?v=1539270417 238 USD InStock Women's Leather Boot All Boots All Products All Sale All Women's Shoes Boots + Chukkas Commuter Collection Everything But 5 for 5 and Travel Everything BUT 5 for 5 Club Membership Heels Shoes & Accessories Shop All The Commuter Collection Women's Size 10 Women's Size 6 Women's Size 6.5 Women's Size 7 Women's Size 7.5 Women's Size 8 Women's Size 8.5 Women's Size 9 Women's Size 9.5 We set out to create a seasoned boot comfortable to wear all day and elegant to wear all night. Made in partnership with an ethical factory in León, Mexico, the Dari Boot comes in classic black with a rubber sole and a beautiful nubuck wheat color with a leather sole.